LONDON (Feb 22): The euro fell below US$1.05 for the first time in six weeks on Wednesday, hit by a combination of concern over France's presidential election campaign and growing expectations for a rise in U.S. interest rates. With the minutes of this month's U.S. Federal Reserve meeting due later, the dominant tone was consolidation for the dollar and some investors returning to the security of the yen, up half a percent against the greenback and 0.8% on the euro. So far, concern that anti-EU candidate Marine Le Pen could win in May and deliver a fatal blow to the euro project have played out chiefly on the options market, where investors pay less to bet on the currency falling. Three-month risk reversals — the weight of bets against the euro over bets on it strengthening — hit their most negative in more than a year, surpassing levels seen after Britain's vote to leave the European Union last year. Implied volatility for the next three months, which allows investors to protect themselves from swings in the currency - or bet on such volatility - rose to the highest since mid-December. 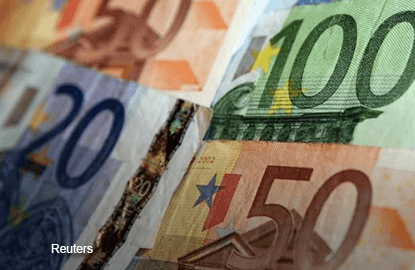 Those moves are also beginning to seep into euro spot prices, which are down about 2% in the last three weeks and fell as low as US$1.0494 in morning trade in Europe. "This is politics, as well as markets increasingly betting on an imminent rate hike by the Fed," said Commerzbank strategist Thu Lan Nguyen. "Volatility is rising, as investors start to prepare for the elections. I think investors are going to play this (the elections) on the options market. If you go short euro and you are wrong, it is too directional." The dollar was stronger against a basket of currencies for the second day running, gaining about a third of a percent. But its retreat against the yen pointed to the scale of concern among investors about global political risks. Yields on shorter-dated German government bonds fell to new record lows. Sterling lost 0.3% to US$1.2441, after the second estimate of fourth quarter growth numbers showed business investment falling. The Fed minutes due later may either reinforce or undermine recent hawkish comments from central bank policy makers that have raised bets on a rise in rates as early as next month. Cleveland Fed President Loretta Mester said late on Monday in a speech in Singapore that she would be comfortable raising rates at this point, if the economy maintained its current performance. Philadelphia Fed President Patrick Harker also told reporters on Monday that he would support a rate increase at a mid-March policy meeting, as long as inflation, output and other data continued to show the U.S. economy is growing. "We think tonight’s minutes will again suggest caution, given still significant policy uncertainty," Commonwealth Bank strategist Adam Myers wrote in a note to clients. "As such, the minutes should prompt a scaling back of March Fed tightening expectations, temporarily undermining USD."